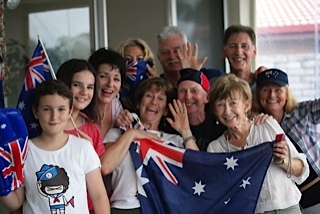 And the rains came….on Australia Day! We knew it was the rainy season in Queensland, and we live in the North of England, which is a constant rainy season. But we didn’t ever expect this. Rain, rain and more rain. The ex-tropical cyclone Oswald hit Broad Beach with winds up to 125 kilometres an hour as it moved down from Cairns, and Vi tells us she has never experienced anything like it in the 25 years she has lived in Australia. The weather forced organisers to cancel Australia Day celebrations yesterday, but at No 7 Bermuda St the revelry went ahead with Vi’s friends…we had a blast. The tropical weather is causing havoc still, and tonight we felt worried as we drove home after seeing the Life of Pi at the cinema. I do hope it passes soon.